The RT100 and RT70 control systems ensure an optimal configuration for practically every application. The RT70 control system and the RT34 controller are a simple and cost-effective solution for a wide variety of applications. All of our controllers are designed to avoid problems before they arise. Automated manufacturing processes require data transfer between the temperature control unit and the production facility's central computer. 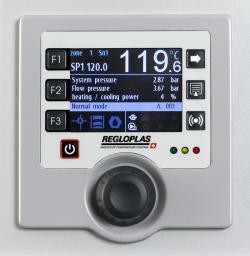 This is just one of many applications for the RT100, RT70 control systems with a data interface.